Good day, chumps and chumpettes! 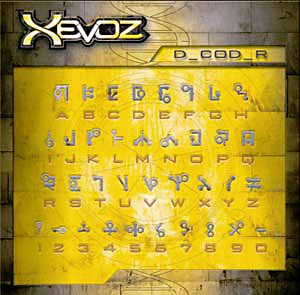 We OAFEs love Xevoz. It's a highly imaginative toyline filled will all sorts of zany characters that have great designs and also tons of articulation joints. Plus stickers if you're some kind of mental defective who enjoys that sort of thing! They're all-around amazing, and you should buy every one of them! But unfortunately, all the info about the toyline that Hasbro has on its website is in the form of Flash animations. On the day that linkrot invariably takes that part of their site away (Hasbro is notoriously bad about keeping content active), that means everything will disappear. Powerful order of magic-wielding warriors. One of the elder species, said to be strongly allied with the Hyperfuries tribe. Attain their mystical skills through intense study of nature and the ancient arts. Agile, strong, far-seeing and fearless. Also known as Zyborgs, the Bio Mechas are a war-mongering group ruled by a fascist leader on the incredibly polluted continent of Zyberia. Although generally thought to be purely robotic beings, they are in fact humans who have replaced many or all of their organic body parts over the course of countless battles. Some are less "upgraded" than others, with only a mechanical eye or spine to show. Others have fully robotic bodies, complete with a brain case that can be removed and fastened onto a new and improved pair of shoulders at will. Soldiers are given the highest honor in Bio Mecha society, and all citizens are expected to fight without question or fear to expand and strengthen the Government's industrial empire. Those who do question it are punished by being sent to work as drones in the many mines and oil refineries of Zyberia. Bio Mechas travel in small units and keep mainly to themselves. A certain amount of intrigue surrounds them and they are commonly suspected of being spies and assassins. Some Neo Sapiens employ the more humanish Bio Mecha mercenaries as soldiers and guards, but these are usually looked upon with suspicion. Hyperfuries were born out of energies that bring about life, change, and destruction in the natural world. Their number includes elemental spirits of earth, water, fire and wind, and well as protector spirits, charmers, riddlers, watchers, and even forms of living energy. All are strongly bound to the mystical forces of nature. Since the dawn of time, human sorcerers have imprisoned these powerful beings inside magical objects and forced them to do their bidding, often to wage war. Many Hyperfuries have now freed themselves of human captors and become the masters of the objects that once enslaved them. Most consider themselves the sworn enemies of man. Hyperfuries lead solitary lives in the wild and remote places of the world. At certain times they are known to congregate in rites of renewal and purification. The ancient certain forests, lakes, mountain passes, and lava floes are best avoided when Hyperfuries are gathering. In his youthful adventures, the reclusive scientific genius Dr. Benjamin Hitmar explored the Madragar rain forest, searching out new plant and animal life and battling countless unscrupulous poachers and gold miners. He became determined to protect the jungle wildlife from those who would ruthlessly or carelessly destroy it, and used his vast scientific knowledge to engineer the breed of guardian beast-men known as the Meta Beast tribe. Numbering only one hundred in total, Meta Beasts are extremely formidable warriors. Their village is located in the ruins of the Hidden City, perched high on a plateau in the Madragar jungle. They represent the height of physical perfection, with amazing strength, agility, and stamina, and an almost uncanny ability to judge a person's character just by looking into his eyes. A stern glance from a Meta Beast is enough to send anyone running off into the underbrush. Those who come unwelcome into the rain forest face a bitter battle, and those who break their laws are hunted down and brought before the Shaman Counsil to be judged. In addition to extraordinary battle prowess, Dr. Hitmar also endowed each Meta Beast with great wisdom. Despite their predatory looks, they are at heart a noble and peace-loving people who prefer to live in harmony with the world around them. They never fail to aid any being who is lost or in danger. Their wisdom and instincts are legendary, and their ability to speak many tongues makes them very powerful negotiators in times of war. Neo Sapiens are the most common species of being on the planet. In early days, their explorers set out from their homeland of New Bohrea to build cities on every continent, and now their species is scattered over all the continents of Geotopia. They are extremely logical people who make excellent scientists, soldiers, architects and politicians. They believe that technology is the answer to all Geotopia's problems, and that there is nothing in the world that can't be made better, cleaner, or more convenient. The lore of Neo Sapiens is full of fanciful stories. Magical creatures prance across the pages of their great literary works, but as the peace keepers of the modern world they have little time for such foolishness. It's all very well for little children to believe in these ancient fairy tales, but any full-fledged member of society who spouts off about fiery monsters and insect men is seen as a wee bit daft. Stories of powerful sorcerers living in the more distant cities are also viewed as old wives tales, and although there are several known magicians in the world, they are mostly regarded as quacks. Magic itself is somewhat of a dying art, since most Neo Sapiens refuse to believe in anything that defies the laws of their science. A grim-faced species, skilled in weapon-craft. Armor-makers to the Arcaster tribe and keepers of the stony places of the world. Dwell in elaborate cavern-cities whose deep secrets they fiercely guard. Some claim ancient ties to the great dragons of old. Sectoid warriors range in form from semi-humanoids to hulking eight-legged monstrosities. They live in hives connected by cavernous underground passageways all throughout the world. Their capital (known as The Hivelands) is located in the sands of The Waste, in Northern Madgragar. They have a reputation for scurrying wildly from place to place in a manner suggestive of utter stupidity, but they are larger misunderstood. All are fierce warriors trained from an early age to protect their Hive at any cost. Sectoids communicate by signs as well as spoken language. Their senses are so highly attuned that they feel an intruder approaching from miles away. Despite their reputation, they are intelligent, fast, and all but impossible to ambush. It's true that with the right lure they can be fairly easily trapped, but enemies who attempt this often fail to take into account the intense loyalty of the Sectoid peoples. An entire Hive has been known to swarm when one of its regiments is in trouble. Millions of Sectoid dwell in every continent of Geotopia, but since most have a natural distaste for the company of humans, their existence is little more than a myth to large populations of people. Which is probably a good thing. It's safe to say that most Neo Sapiens sleep better not knowing what creatures scurry and buzz in the ground deep beneath their homes. Unnaturals are a grisly breed of monsters, mythical creatures, zombies, and skeletons. They are known for their hideous appearance and general lack of manners. Many lead a solitary existence, lurking in the shadows and preying on unsuspecting travelers, but some are just tricksters out for a laugh. They will unite on occasion in small raiding parties, usually near crossroads, in dark alleys, and on lonely marshes where merchants and tinkers tend to get lost. Some possess mystical abilities; a rare few are great sorcerers. It is said that many have congregated deep in the fogs of Tombstone Island. Atlantia, New Bohrea's great western city, sits on a wide green plain overlooking Oceanus. The King holds court here with his ministers and family, and in times of political trouble the city serves as a peaceful haven where ambassadors come to work out the terms of peace. 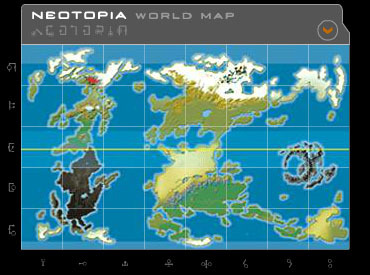 Despite its great age, Atlantia is one of Neotopia's top technological centers, and many of the world's foremost scientists teach at its schools and universities. The streets around are heavily patrolled by Alpha Ranger units and Omega Guards. The beauty of this great domed metropolis is throughout Neotopia. In the morning its buildings are brilliant white, and at night they shine like silver under the moon. Its towers are so tall and slender that it seems like a strong wind could blow them down, yet they have stood for hundreds of years against hurricanes, earthquakes, and even dragon attacks (according to legend). The city is ringed by orderly suburban neighborhoods that offer all the very latest high-tech comforts and conveniences. 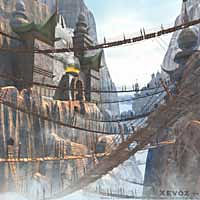 An elaborate cavern-city located in North Janu. 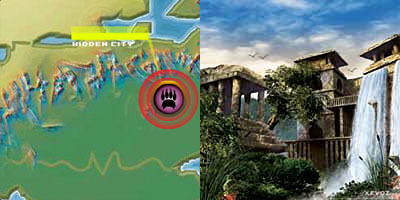 Of all the ruined cities of the Ancients, The Hidden City is said to be the greatest. It is also almost impossible to find - in fact it is so well hidden that many believe it to be only a myth. The city is the home of the noble Meta-Beast warriors, who have built their village amongst its fallen pillars and crumbling temples. The city's mighty walls stand on a high plateau, in the heart of a jungle so wild that no ordinary humanoid can find the path leading up to the gates. Thick groves of vine-covered trees forever hide the marble towers and battlements of the Hidden City from the rest of the world, and watchful eyes of Razor Claw guards are always on the lookout for those who would enter and break peace. 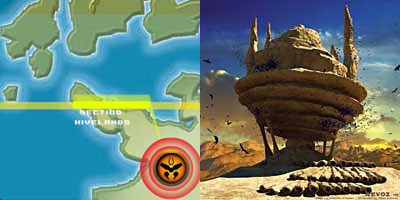 The Hivelands, homeland of the Sectoids, are located in the northwest region of the vast desert known as The Waste. Visitors here might want to keep a can of bug spray handy: the Hivelands are the dwelling place of the Sectoid Queen and her army, and the sands here are crawling with Bonecutter scouts. For centuries the Sectoid people have occupied these lands in peace and secrecy. However, when Neo Sapiens began piling their wrecked vehicles and outdated household appliances on the dunes above the Queen's hall, the Sectoids made their presence known in a big way. Now they control all the natural wadis (underground springs) that feed the small oasis towns of The Waste - a situation that has lead to many inter-species squabbles. Each year loyal Sectoid subjects from every continent return to the Hivelands to honor the Queen. Squeamish humans might want to avoid the northwest during this time. Located on the continent of Janu. 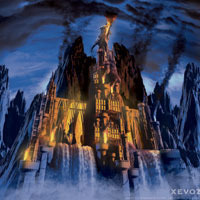 To get to the fire-belching fountains of Magma Falls, you must travel eight days past the Bodyul Mountains of northen Janu and over a vast glacial plain. 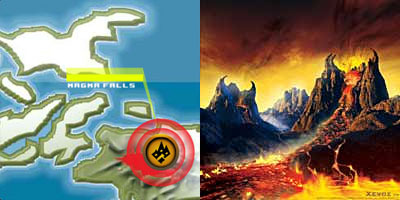 Magma Falls is a wild and desolate land of choking fumes and rivers of fire. It is sacred to the Hyperfuries. No known plant or animal life can survive here, but some people believe that the dragons of the far northern isles were born near its lave-filled craters. Each year, the Inferno Furies return to Magma Falls to be strengthed and purified in its molten streams. 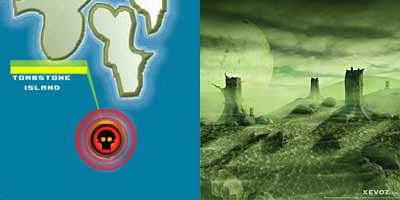 Hidden deep in the fogs of the Forbidden Sea is Tombstone Island, home to the ghoulish species known as the Unnaturals. As far as ambience, the name tells you pretty everything what you need to know: it's creepy, it's clammy, and it's more than a little dank. The island has never been properly charted (surveyors and explorers have a funny way of getting "lost" here), but it seems to be a craggy land of barrow towns, howling hills, and ghost-infested battlefields. The stinking bogs of the midlands are a popular attraction for Unnatural tourists, but be sure to keep your ingots in your boot: these lands are full of Skull Jack pickpockets. 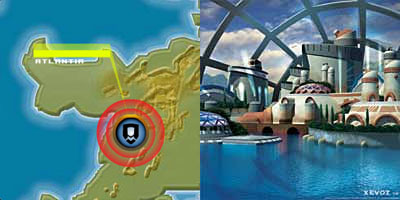 Zyber City, with its smoke-belching coal-powered factories, is the capitol city of the Bio Mecha Zyborgs. The air is so thick with soot here that you need a flashlight to see if it's night or day. (Notice we said flashlight, not match; the air in Zyber City is so full of fumes that if you light a match it will likely blow something up.) If you travel here, don't expect a warm welcome. 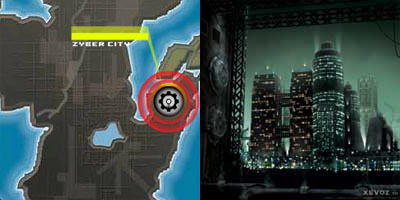 All visitors to the City must have their passport stamped at the one of the many Government Offices located in the maze of identical bunkers downtown. It may take a few days to find the right office, and once you do manage to find it, the official in charge will probably tell you that your papers are not in order so you'll have to start all over again. Whatever you do, never mention the word bribe to one of the Sledge Trooper guards - unless you're prepared to spend a few days in jail. *These were added after the start of the line, so weren't included on the official Flash site; information comes from the booklets included with the toys.